It has a refreshing and unique taste due to its naturally balanced mineral content and is ideal for helping replenish minerals lost throughout the day. Given that the average diet contains an abundance of acid-forming white sugars, white flours, overly processed meats and dairy products, a correct acid-alkaline balance is essential in establishing a foundation of optimum, vibrant health. Saka Water rises from a pure, remote and protected aquifer which is bottled at source under ultra-hygienic conditions, untouched from source to bottle, leaving it as nature intended it. The unique source of Saka is located in the Keremali Mountains of the Sakarya Province in Turkey, away from industrial, agricultural lands and settlements. 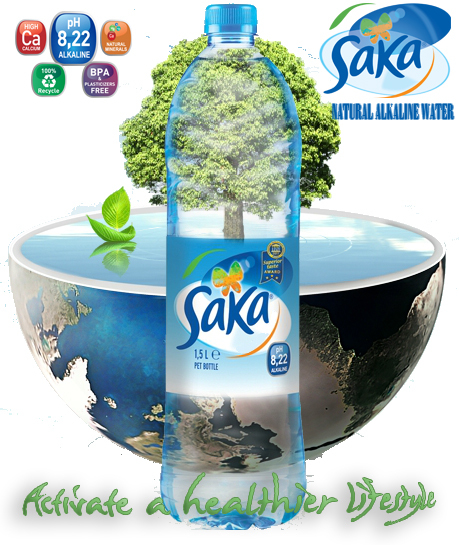 The quality of the water and natural composition is officially recognized by SGS INSTITUT FRESENIUS and NSF which helps to ensure that Saka is compliant with all regulations in the 25 countries that it is sold in. The bottling facility has been developed with state of the art technology and it is one of the fastest bottling plants in Europe and Asia producing up to 20 bottles per second. Saka’s bottling capacity is 1 Billion Liters annually. Saka is produced with respect to ISO 22000 Food Safety-HACCP, ISO 9001:2000 and TSE regulations. Saka has introduced one of the lightest 500ml water bottles designed to be easily crushable. These new ecofriendly PET bottles are designed to reduce their environmental impact by using 30 percent less plastic. The reduced plastic on Saka bottles significantly reduces the carbon emissions in the manufacturing and disposal processes. The bottles are also BPA free and recyclable due to their PET design.